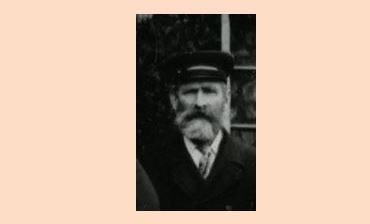 Thomas Coleman, pictured in later life, circa 1904, when serving as the fire station caretaker. Superintendent Thomas Coleman of Ventnor Fire Brigade passed away on 11 October 1932 aged 86. It's been difficult to ascertain an accurate timeline of Thomas's personal life due to the records of several individuals of the district bearing the same or similar names with no outstanding fact among them to positively identify the correct person. What is known from contemporary newspaper reports is that for over half a century Thomas operated as a longshoreman and he was the well known part-owner of one of the areas best known sailing boats. Given his brigade service the vessels name The Alert is highly appropriate. For much of his life he resided at St Catherine's Street. It is likely that he was a member of Ventnor's fire brigade for a considerable spell but he didn't appear in any Press reports until the early 1890's. When the fire brigade were among the attendees at the funeral of the esteemed Mr Henry Ingram on 22 October 1894, Thomas is listed as the brigade's Superintendent. Thomas's role often caused conflict with Ventnor's troubled Captain Frank Rennick over a period of many years due to the nature of the administration of the brigade imposed by the district council; a unique arrangement among Island fire brigades that allowed Thomas, as superintendent, to overrule the captain on all matters with the exception of commanding the firemen at fires where he took the orders from the captain. When a young and ambitious arrival to the town, John Franklin Baker, vied for the captain's role in the aftermath of Rennick's death in 1896, Baker insisted that the structure was abolished and he be given total control. While the councillors delayed a decision Baker offered to settle the matter in a timed drill competition between a team selected, trained and including him, against a team of the old guard as selected by Thomas Coleman. The councillors accepted the method of decision making. The drill-off ended with Baker's team defeating Coleman's in all three of the proposed drills. Nevertheless Thomas showed his strength of character and his commitment to the town by accepting his future role as that of fireman under Baker, who at the time was his junior by more than twenty years. When Baker died as the result of a tragic shotgun accident in the following year, Thomas remained a fireman and continued to serve for many more years under the new captain William Pearson. He maintained an active interest in the brigade long into his retirement, serving as fire station caretaker, and was noted for appearing in the Ventnor carnival of 25 August 1920, bearing his aged fireman's uniform and accoutrements and in charge of the town's oldest fire engine dated from 1840, which had been retained as an antiquity. Rest in peace Superintendent Coleman.